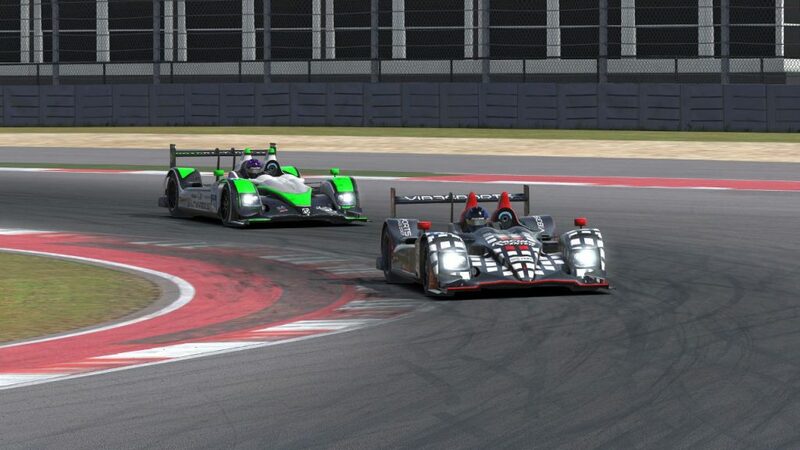 The departure of the top HPD teams from past NEO Endurance Series seasons left a void in the P2 class in search of a new frontrunner. After two races so far this season, one team has separated itself from the pack as the favorite at the pointy end of the field. From the beginning of the weekend at Circuit of the Americas, AVA Vervatic had the car to beat. In every practice session they competed in, they topped the time charts, then Pascal Stix powered to the pole position with a qualifying lap a quarter-second quicker than second-place Dirk van Tulden for Torque Freak Racing. Once the green flag flew, their #39 prototype continued riding the proverbial rail around the 5.5-km Texas track. But that doesn’t mean life was easy in the HPD at COTA. AVA Vervatic leads the P2 field into turn 1. 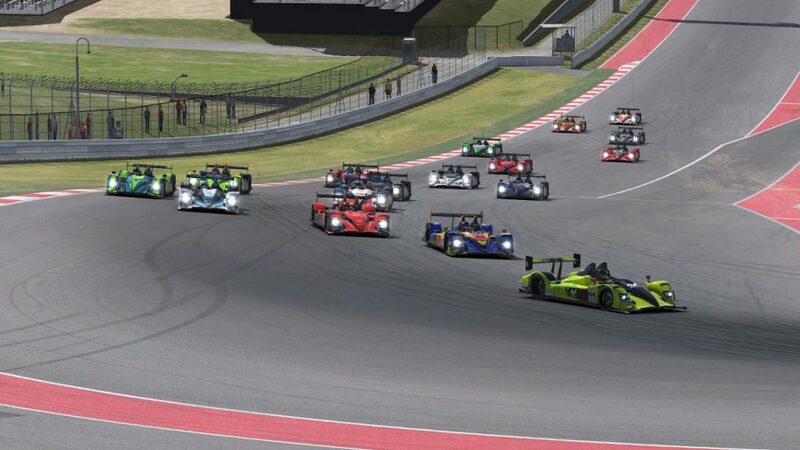 The first lap saw an incident further back in the pack when Dean Moll for iRacing Today Motorsports checked up exiting the esses and a pair of cars — the RoadBasterds HPD driven by Ronald Gross and the RacingCenter Vib3sports machine of Louis Klinkhammer — piled in. Gross suffered the worst of the damage after nosing into the armco, effectively ending their hopes of a top-ten finish after starting thirteenth. Negotiating traffic was at times testy for the HPDs, as their middle-class status forced drivers to have their heads on a swivel through COTA’s corners that demand complete concentration. 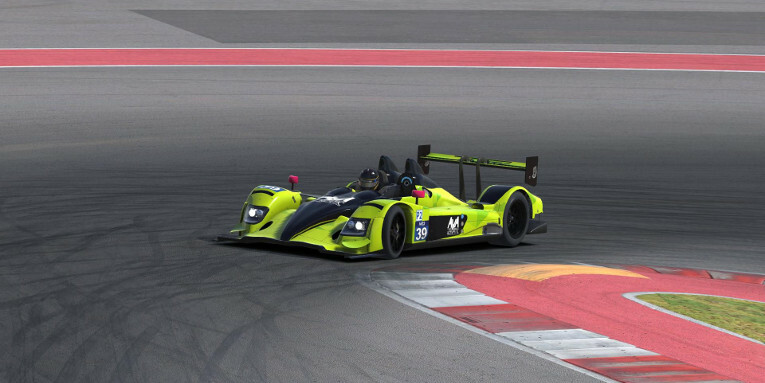 One problem-plagued team was Inertia SimRacing Corsac. They had high hopes with Finnish sim racing star Riku Alatalo on loan and qualifying their #59 car in fifth, but they hit a bump in the road on lap 16 when they were spun in the esses by the Team Eighty-Five GT Porsche. It wasn’t the last incident they faced during the race. Early in the second stint, Alatalo was hit by the #20 VRTeRacing P1 car as it left the pits, and just six laps later, they came together with the World of SimRacing Team’s #51 car that was also exiting the pit lane. 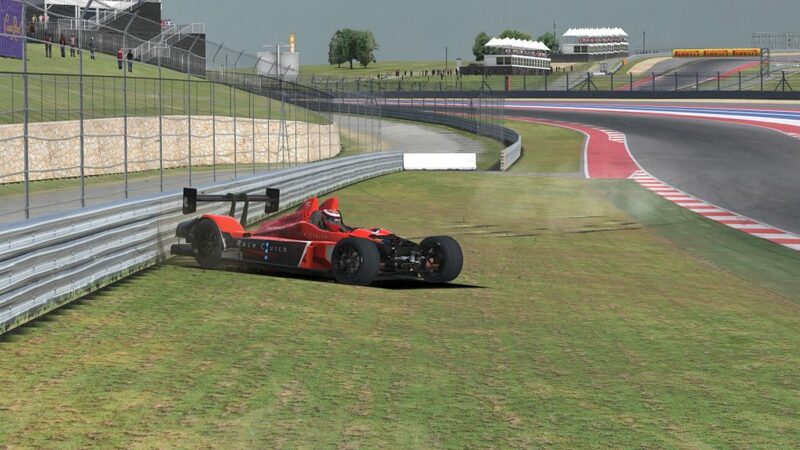 Officials deemed both P2 cars at fault for the accident, but it was yet another setback for Alatalo in his NEO return. Inertia SimRacing Corsac and the World of SimRacing Team come together on lap 31. The end of the first hour saw AVA Vervatic leading by nearly the length of the front straightaway over the new second-place runner, Alex Simpson from Apex Racing UK. Indeed, the P2 field was effectively broken up by the combination of traffic and varying pit strategies, with some teams such as Race Clutch pitting 5 to 6 laps early in each sequence of stops. As the race neared the halfway mark, the top five positions were largely locked in place. Ten seconds adrift of AVA, Race Clutch supplanted Apex for second with Torque Freak in fourth and UI1-Positive SimRacing running fifth in a strong showing by Glenn Key and Renan Azeredo. Behind them, the battles were only beginning to heat up. A hard-charging Egil Sandfeld recovered from an early pit lane speeding penalty to bring IRDK Endurance back up to sixth, passing Alex Trainor in the Luxsim24 MOATF Podcast car on lap 82. Another big mover was SRN Motorsports, which started sixteenth but passed Team Heusinkveld on lap 94 for tenth place. After falling to dead last in the first hour, Inertia SimRacing Corsac also climbed back inside the top ten with Joonas Vastamäki at the helm. SRN Motorsports’ Scott McGarvey and Team Heusinkveld’s Ronny Fantini drag-race down the backstretch. In the final two hours, action began to unfold further up the field. After briefly inheriting second place during a pit stop cycle, Torque Freak’s Martijn Joon spun the SimRC.de GT car with an ill-executed pass attempt in turn 7 — a trouble spot in traffic all race. The ensuing stop-and-hold penalty — the only one levied against a P2 team for avoidable contact in the race — dropped Torque Freak back to fourth. However, they didn’t have to wait long before they were gifted a podium position. While Race Clutch was more than 30 seconds behind the leading AVA Vervatic car, they had a solid hold on second place in class. With just 50 minutes to go, though, contact with the Virtual Motorsport Audi exiting turn 18 put Race Clutch’s Aurélien Talmon into the wall. For the second straight race to start the season, a potential podium turned into a disappointing DNF for their P2 team. Race Clutch’s race ends with a lap-156 crash. Besides Torque Freak, another benefactor was TNT Racing, which had one of the fastest cars on track with former iRacing world championship competitor Benjamin Lindsay behind the wheel. Lindsay passed UI1-Positive SimRacing and the MOATF Podcast team to enter the top five, then was elevated to fourth after the Race Clutch accident. Of course, all that unfolded in the mirrors for AVA Vervatic, which saw a smooth drive by Stix and Sven Neumann to capture their second win in as many races this season. Apex Racing UK came home in second. Torque Freak finished third, but not without a bit more late-race drama. 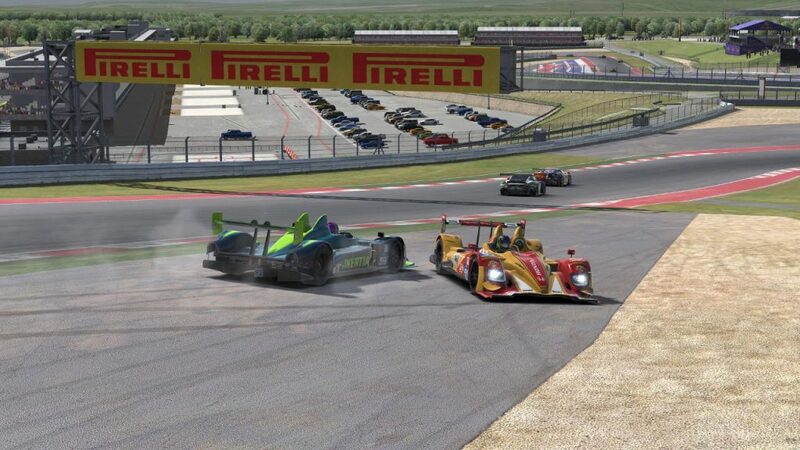 With four laps to go, they were spun by the lap-down UI1-Positive SimRacing car in the tight turn 15. TNT Racing was a half lap behind at the time of the incident, so they weren’t able to capitalize and finished in fourth. 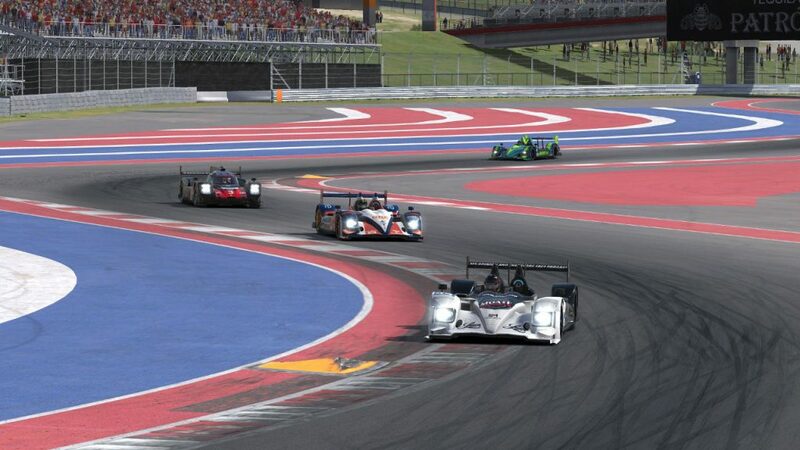 The MOATF Podcast team recovered nicely after a Sebring DNF to earn a top-five result at COTA. 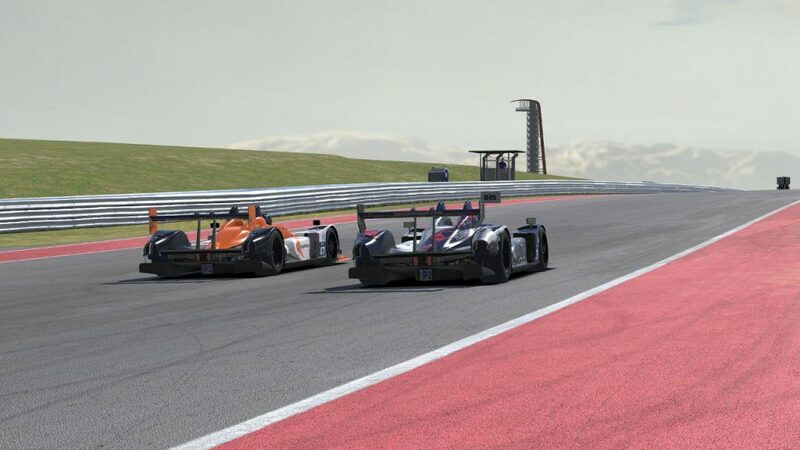 They narrowly defeated IRDK Endurance and Inertia SimRacing Corsac in a battle that came down to the final laps. Neil Andrews leads Egil Sandfeld and Ilkka Kattilakoski through the esses on the final lap. Despite a promising start, UI1-Positive SimRacing faded late in the race and finished eighth. Team MAD scored its first NEO top ten with a ninth-place finish and Schubert Motorsport, which briefly ran as high as second place early in the race using an alternate pit strategy, finished tenth. SRN Motorsports was eleventh and the World of SimRacing team, which was twice penalized for exceeding track limits, ended up in twelfth. Team Heusinkveld was damaged in a crash with a P1 prototype with just over an hour remaining and finished thirteenth. They were followed to the finish by the trio of teams involved in the lap-one incident. RoadBasterds, iRacing Today Motorsports, and RacingCenter Vib3sports were fourteenth through sixteenth at the checkered flag. RacingCenter Vib3sports leads RoadBasterds through the stadium section. Race Clutch was the only P2 car not to finish, as their HPD was too heavily damaged in the late incident. While Race Clutch and other top teams have at times shown the pace to contend with AVA Vervatic, they have all found it tough to beat a team that rarely makes mistakes and has weekend-long pace to boot. Any burning questions about the NEO P2 class needing a new name out front are quickly being extinguished. After a wild west shootout, it’s becoming increasingly clear that there is a new sheriff in town, and their squad car is a lime green prototype.